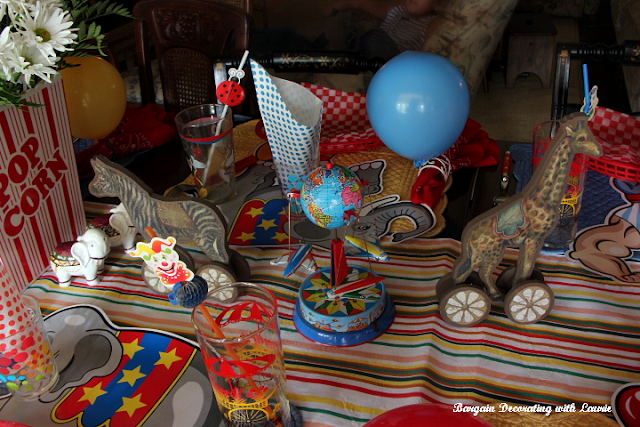 Our youngest grandchild turned three last week, and we celebrated with a circus theme. 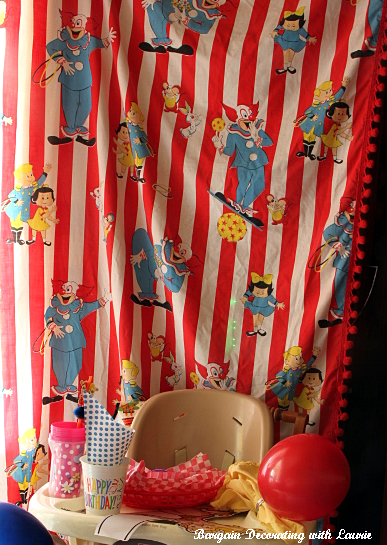 I bought that "Bozo" bedspread at a flea market one time. Does anybody else remember Bozo? 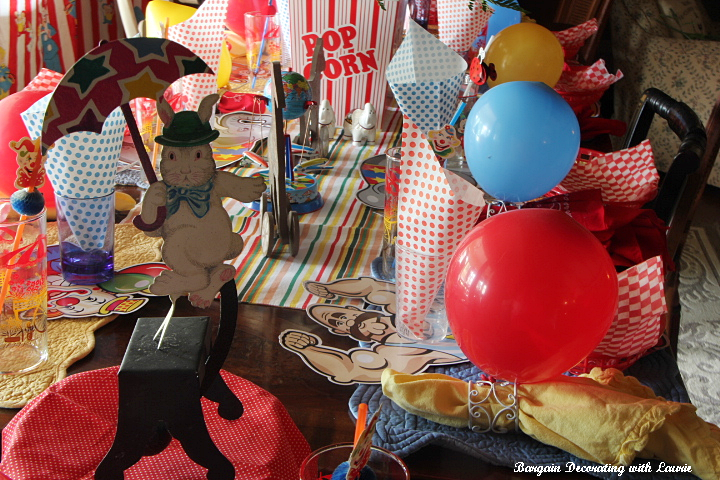 This tablescape was as wild as the child who was celebrating her birthday! 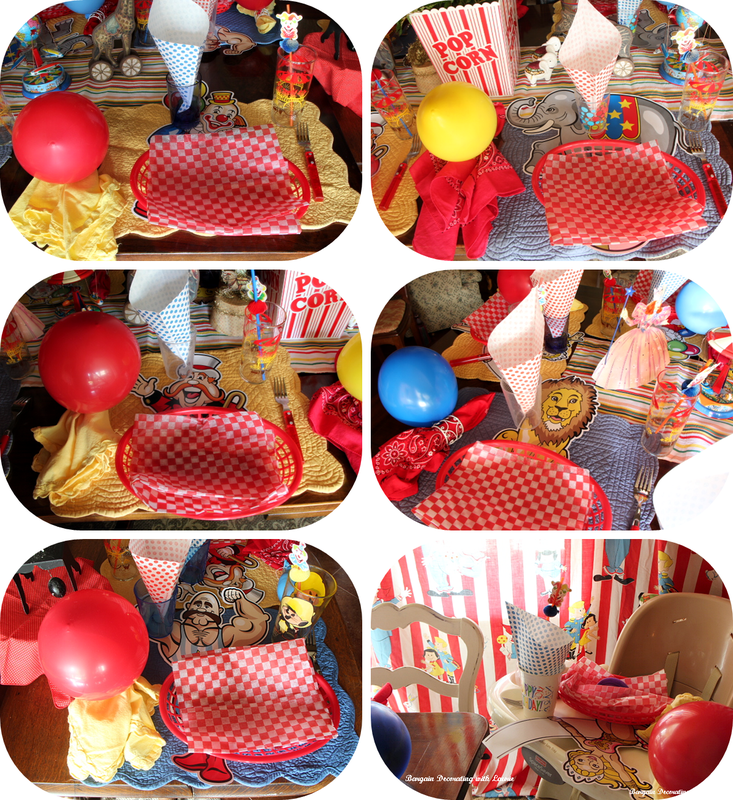 Each place setting began with a blue or yellow placemat. A cutout of a circus performer, human or animal, topped each mat. 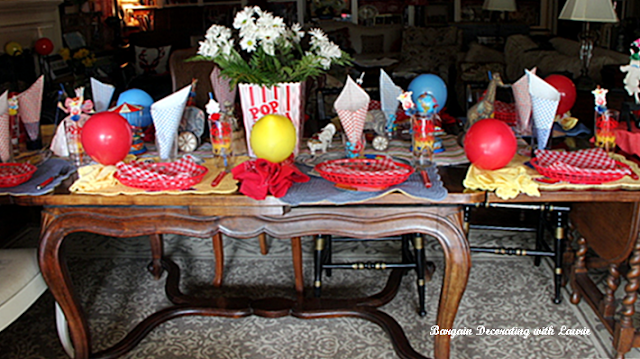 Our granddaughter loves balloons, so I tied red, blue, and yellow balloons on the napkin rings securing alternating red and yellow napkins. We used restaurant baskets for burgers and paper funnels for French fries. Daisies in a popcorn box were surrounded by circus performers and children's rides. 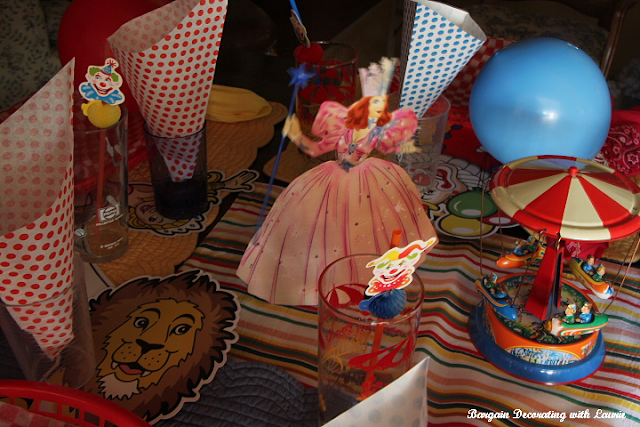 Clown straws were used in vintage glasses with flower cart images. 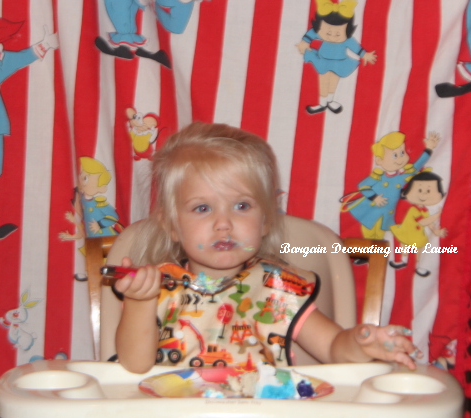 Now that all but one of our grandchildren have outgrown the high chair, I have to add a small table on the end of our dining table to seat everyone. This balancing bunny was performing on the added-on table. 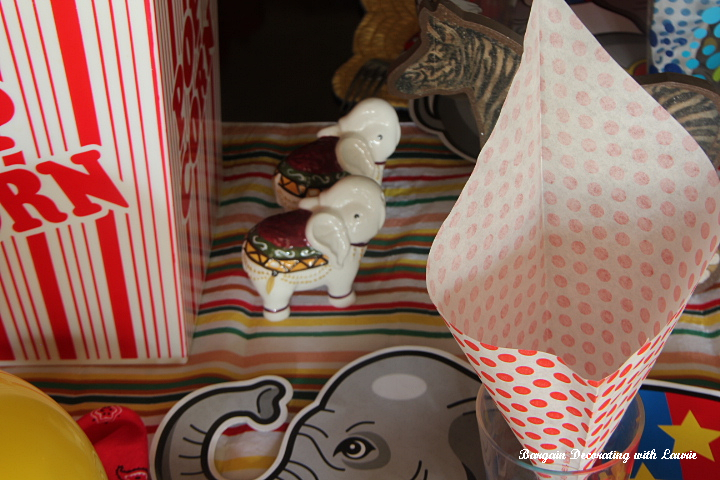 Circus elephants brought us our salt and pepper. Can you tell she enjoyed her birthday cake? Thank you for coming by to celebrate Bradleigh's birthday with us. What a lucky girl to have such a special birthday celebration at grandma's. Everything looks so cute. The birthday girl is adorable! 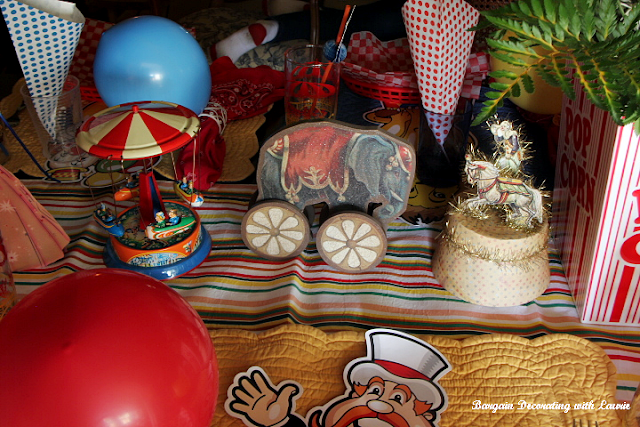 Love the theme and the darling circus figures. Are they vintage? If I had known you were doing a circus theme, I could have sent you some plates I have. I bought them years ago from William Sonoma and have never used them. Not even sure where I have them. '-) Would you want them?